I'm not sure why, but I really do care – a lot. Other than kindergarten, I never attended a public school, but I have always rooted for their teams – of course the exception being when they played my alma mater. I have no apologies for that, as I know I have been more than fair to the teams and athletes over the years. This is why I have no qualms about writing this article; being a fan is as good as being an alumnus, and I am no Johnny-come-lately when it comes to rooting for the Erie public school teams. This was almost a rant, but I actually waited a couple days to calm down before putting this on paper – or in the computer. I have been covering Erie sports for nearly 40 years, and I have been extremely consistent in my opinion of the support – or lack of support – by the Erie School District (Erie School Board) for its teams, coaches, and athletes. As a matter of fact, at times it has almost been unethical as well as extremely frustrating. First, each school not having its own Hall of Fame is beyond obscene; addressing this should've been done years ago – many, many years ago. As in at least 50 years ago. And if the schools didn't have enough gumption to do it themselves, then Erie School District should have a Hall of Fame for all the schools, but this would've taken some work. Heaven forbid! The worst part of all of this is that it's way, way too late to honor our past greats, as that horse has left the barn. Keeping in mind, though, that this is something that should've been done a long time ago, it's impossible to blame the past few school boards and the past few administrations. However, something should be done currently to remind our young people about the legends of yesteryear as we look to inspire them and show them what's possible today. I keep hearing about lack of funds every year and how we need more money for the "kids." Well, I have a bulletin: It doesn't take much to remind the students of today about history. Where would you go in the Erie School District to find about our great athletes and teams from the past? It is a disgrace to go past our high schools and not see signage reminding everyone of individual state champions and that team that "won it all." I'm sure with all the talented young people we have in the District, this would be easy to get done and cost very little money. I am going to give some samples of some of those greats from the past, and I wonder if any of the students today have any idea about them. But it's not their fault. What's more, I wonder how many School Board members can tell me who these people are? It seems to be a lot easier to whine about lack of money instead of doing something inexpensive to inspire our youngsters. It's a lot easier waiting for a handout than it is to do some research. Also, I could write for days about the lack of facilities for the Erie kids. How about this one tidbit to showcase that setting? When Jon Cacchione coached baseball at Strong Vincent for three very successful years, his practice fields were the softball field at Grover Cleveland and the football field at SV. Geez, I wonder why he ended up the head football coach at McDowell. 1. ART BAKER (Academy) – If he had accomplished this in Canton or Massillon, these towns would have a statue of him somewhere and a school named after him. Last time Art was in Erie, he was an assistant football coach at Cathedral Prep. Should the current students know these facts? Baker was the second African-American to win a PA state title in wrestling and the second to do it in the NCAA while at Syracuse, as a matter of fact winning two state crowns at 165 (1956) and 185 (1957). 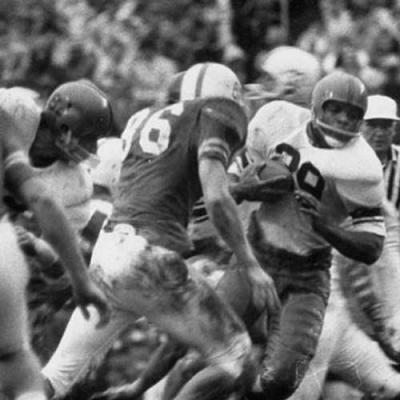 He also started for the Orange national championship football squad in 1959, playing next to Heisman Trophy winner Ernie Davis, the first African-American winner of that prestigious award. Baker played two years with the Buffalo Bills in the AFL, four in the CFL, and was also the number-one choice of the Philadelphia Eagles in the 1960 NFL draft. 2. CRAIG and R.J. Costello (Tech) – Dynamic brother combination for the Centaurs, starring in football as well as capturing state wrestling titles. 3. BILLY and BOBBY BRABENDER (Strong Vincent) – The first brothers to win state championships in wrestling, the fiery twins were also great coaches in the Erie School District, Bobby at SV and Billy at East. 4. WOODY THOMPSON (East) – A football, wrestling, and track star for the Warriors, the powerful Thompson starred in college at the University of Miami (FL) and played in the NFL with the Atlanta Falcons and Cleveland Browns. 5. TOM LAWLESS (Strong Vincent) – Lawless was a baseball and wrestling star for the Colonels and an outstanding baseball player at Penn State Behrend. He was best remembered for hitting a game-winning home run in the 1987 World Series for the St. Louis Cardinals. 6. ESSIE HOLLIS (Strong Vincent) – One of the most popular athletes in Erie history, "Easy Essie" was a high school All-American basketball player at SV, led St. Bonaventure to an NIT title, and played in the NBA with the Detroit Pistons. He also played in Spain where he achieved Michael Jordan-type status with the fans. 7. 1985 STRONG VINCENT basketball team – The Colonels lost one game that season and romped to a PIAA state title. SV coach Pete Flinn ended up as an ultra-successful cage boss at McDowell. 8. 1991 STRONG VINCENT football team – The SV gridders lost one game and captured a state championship. These are just a small taste of the great performers and teams. Where would you go to find the rest of them? It would be nice to drive by our City schools and see some kind of recognition of their great athletes and teams outside the school. I wonder if there is even anything inside remembering each school's finest. Again, the blame can't go to the current Erie School Board or the current administration, but they haven't helped either. As former Superintendent Jim Barker used to say when I called him, "That's a great idea." Little did I know, he must've been laughing himself sick after the phone call ended. I have three words for past and current School Board members and past and current administrations – (1) SHAME) (2) ON (3) YOU! Two weeks ago I was coaching at the PIAA State Championships for Track/Field in Shippensburg, Pa. As my female athlete approached the starting line, I could not help thinking: "How many of these athletes made it to this level by training on a 6 inch wide dirt track?" During practice, my track team looks more like a rugby team, covered head to toe in mud.